Tony hosts his own weekly show and podcast, “Kill Tony,” which has over 200k downloads per week. On the road he sells out with strong drawing power due to his podcast, being a regular on The Joe Rogan Experience, and years of opening/featuring theaters on tours with Jeffrey Ross, Joe Rogan, Dave Attell, and most recently Dave Chappelle. Tony recently added to his podcasting empire with his interview podcast “The Pony Hour” and his hilarious pro-wrestling panel podcast “The Store Horseman” which Tony records with his friends Josh Martin, Chris Burns, Matt Edgar and Johnny Skourtis. Here are some more of Tony's accomplishments...a writer for NBC’s New Year's Eve with Carson Daly, Will Ferrell’s one hour special, the Comedy Central Roasts, the Comedy Central specials Jeff Ross Roasts Criminals: Live at Brazos County Jail and Justin Willman’s Sleight of Mouth. 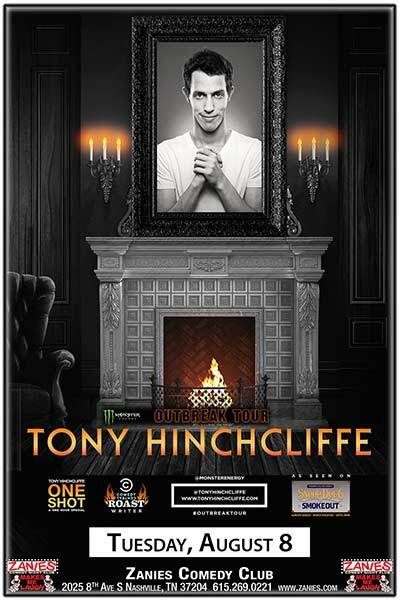 Tony was the opener for the 311 tour, appeared on NBC’s Last Call w/ Carson Daly and Comedy Central’s @Midnight. Hinchcliffe is one of the most widely respected punch up writers for both TV and standup and is highly trusted by some of the best comedians in the world (Chris Rock, Dave Attell). His dark, free flowing, and truly unapologetic standup comedy style is already well known in Los Angeles and will steal the show at many upcoming comedy festivals, tours, and venues around the world.